Hey, have you been wondering how some of us have been able to create colors like these? Well, I just uploaded a video showing you how to. This is just one of many I plan to do. Wait... when did I have six arms?! 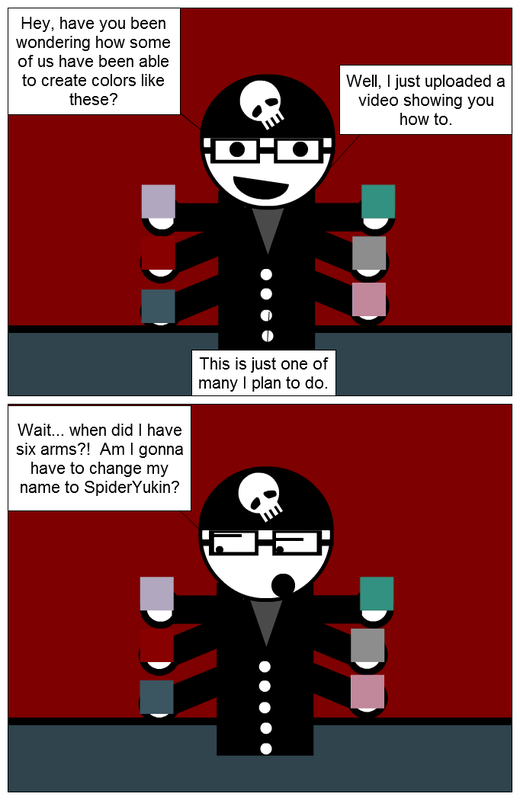 Am I gonna have to change my name to SpiderYukin? I know that probably half of the people that comment on my strips know how to do this. But for everyone else and for people to share, I have decided to start doing some tutorials for SG. Some everyone could benefit from (say how to create a certain gun, item, or character) and others for those who are newer. At least watch and rate the video (maybe comment) to help get the video bumped up. Hey, have you been wondering how some of us have been able to create colors like these? Well, I just uploaded a video showing you how to. This is just one of many I plan to do. Wait... when did I have six arms?! Am I gonna have to change my name to SpiderYukin? Good tutorial! I like your voice ^^. Thanks for all the videos! I've got some practicing to do! GREAT tutorial Snake. A technical question: What software do you use to capture the video? Very, very good job ! Maybe you will have to change your name..